Outdoors, indoors, or any place at all! 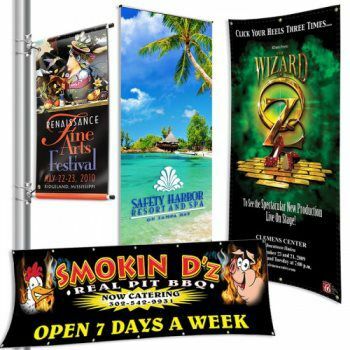 Our large selection of banner material and finishing options ensures the best material for the right application! Since everything we do is custom the possibilities are endless! It’s been said that we go a little overboard in the construction of our vinyl banners. We double needle stitch our hems with an industrial strength polyester thread and add a 1” heavy-duty polyester webbing to the top and bottom hem. It’s finished off with solid brass Spur Toothed Grommets that grip the vinyl and webbing to reduce tears and pull-outs. It may sound like a lot and it is! We never know what weather conditions our banners will have to face when hung outdoors, but if hung properly, they’re “Built To Last”. Feather Flags, Table Covers, Chair Covers, Banners, Backdrops, Podium Banners and Table Drapes in all shapes and sizes! We have a fabric solution to fit your needs. Our in-house sewing experts can customize your job with the addition of Pole Pockets, Dowels, Fringe, Tassels, Weights, Velcro, decorative Cord or any one of the many other specialty options available. Our 8 oz Banner Mesh is a reinforced banner material manufactured with polyester support cloth and coated with PVC. It is engineered to achieve approximately 35% airflow while still maintaining excellent printability. Our 1000 Denier mesh is perfect for those applications that will expose banners to high winds. Our mesh is ideal for Banners, Building Wraps, Fence Wraps, Stadium Wraps or for projects when a see through effect is required. 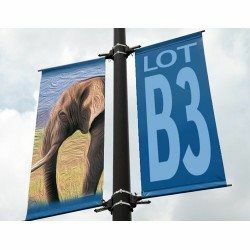 Pole Banners, Street Pole Banners, Avenue Banners, or Main Street Banners; call them what you like, we have them. From printing and finishing to the mounting Hardware Kits, we have all your needs covered when it comes to Avenue Banners! They are perfect for cities, schools, car dealerships, and organizations. 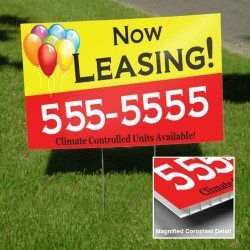 Our Avenue Banners are a great way to brighten up your street, building or parking lot and have your message seen! Like everything we print, we manufacture and finish our Avenue Banners in house so you’re assured to get the right material, finished to your exact specifications, and printed in high-resolution digital color to guarantee you get exactly what you’re looking for! Turn your ugly steel barricades into a branding opportunity for yourself or your sponsors. 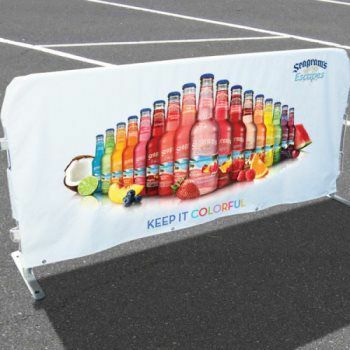 We offer custom Barricade Covers printed in high-resolution digital color, cut and sewn to your exact specifications. We can accommodate any linking mechanism on the ends of the barricade and imprint can be single or double sided. We have a variety of materials perfectly suited to fill your long or short term Barricade Cover needs. Let one of our Barricade specialists assist you in creating a Barricade Cover that will withstand both the elements and the most exuberant fans. Give your audience a lasting impression of your company or organization with our elegant Podium Banners! Podium Banners can be produced in any one of the many fabrics we offer. Our Soft Poly Knit fabric offers a distinctive professional look while our Satin fabric adds a bit more pizazz to your image. 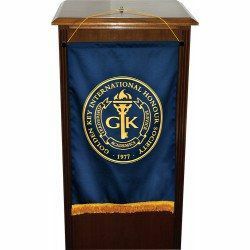 Each Podium Banner is custom produced in house by our expert production team and is finished to your exact specifications. Podium Banners can be permanently hung or easily transported from one event to another. Finishing options include Dowel Rods, Fringe, End Caps, Decorative Cord, Tassels, V-Cut Bottom, Grommets, and Eyelets. Our state-of-the-art digital printing equipment allows us to print directly, and in full color, on almost any rigid substrate. 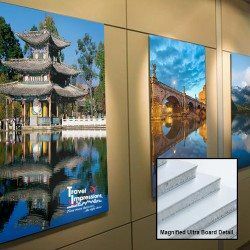 Enjoy the endless possibilities of printing directly onto a number of substrates like Plexiglass, Aluminum, Stainless, Coroplast, Mirror finish, Sintra Board, Foamcore, MDO board, and more! 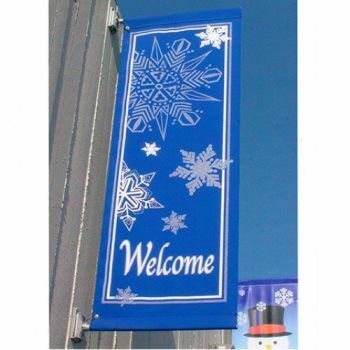 Rust free Aluminum Signs are perfect in any weather condition and are built to last. Our standard thickness of .040” has a white gloss finish that renders vivid color reproduction. Heavier gauges are available for the toughest applications. 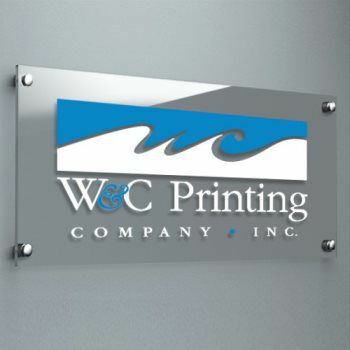 If you are looking for a strong, long lasting sign material, there’s no better choice than Aluminum. Our Aluminum is available in several different finishes as well (Brushed Silver & Gold Aluminum pictured). Ideal for political, real estate and almost any indoor and outdoor graphic application, Corrugated Plastic Sign Board can be printed with full digital color. 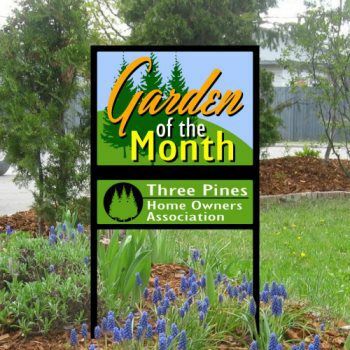 Highly resistant to outdoor elements, the flute construction makes installation of yard signs a snap with our metal Step-Stakes. Standard thickness of 4mm can be cut to any size or shape and can be printed with either a single or double-sided image. For heavier-duty or long-term outdoor needs we also stock 10mm Coroplast that’s unbelievably tough. 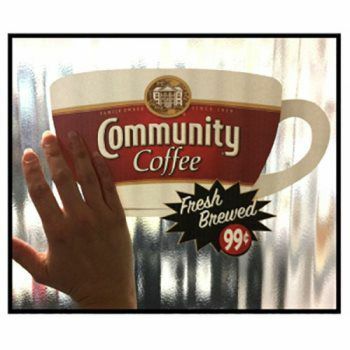 Foam Board is a lightweight economical option for temporary indoor signage. Foam Board is comprised of an extruded polystyrene foam core sandwiched between two layers of white card stock. 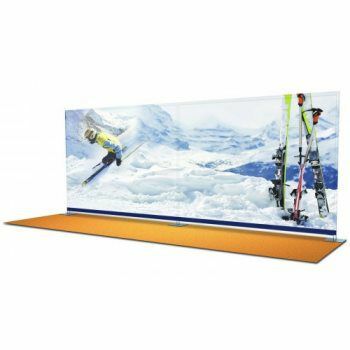 Available in thickness starting at 1/8”, Foam Board is the versatile all around graphic and display board choice that can be imprinted with a single or double-sided image. Suggested for indoor use. Our Smart Board perfectly marries the low cost of our Foam Board material with the high-grade indoor durability of our Ultra Board material. 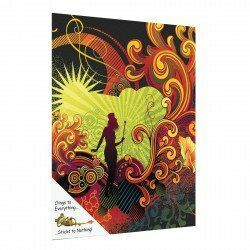 At 3mm thick, Smart Board is constructed of rigid, double-layered cardstock material and is 100% recyclable. It features a smooth matte finish and, unlike Foam Board, is durable and dimple resistant. Suggested for indoor use. Ultra Board offers the same extruded polystyrene foam center as Foam Board but is sandwiched between two layers of Styrene making it considerably more durable than Foam Board. Designed for indoor use it is lightweight, water-resistant and warp-resistant. 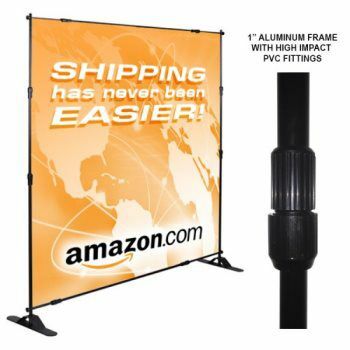 Perfect for Tradeshow applications, POP Displays and other long-term portable signage needs. 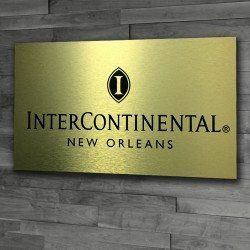 Styrene is a flexible, water-resistant polystyrene plastic that has a smooth satin finish making it ideal for POP Signage, Displays, Tradeshow applications as well as a multitude of other signage needs. Offered in thickness of .040” and .060”, Styrene can be imprinted in full digital color with a single or double-sided imprint. Styrene is lightweight, reproduces brilliant color, and can be loosely rolled. Sintra Board is a lightweight yet rigid board of moderately expanded closed-cell PVC plastic material that is extruded to sheet form with a low gloss matte finish. Sintra Board is a tough and versatile material that is perfect for both indoor and outdoor use in a wide array of applications. Available in a variety of thicknesses starting at 1/8” thick, Sintra is available in many colors and can be cut to any size or shape. 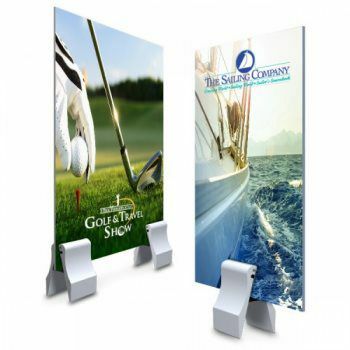 Perfect for Exhibits, Kiosks, POP Displays, and Signage. 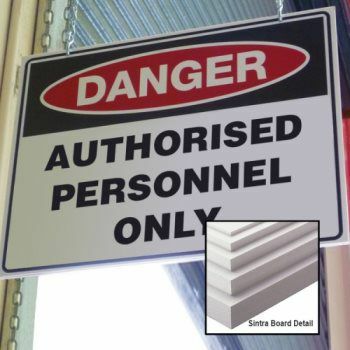 Plexiglass makes a powerful statement when used in Displays, Awards, general and Architectural Signage. It's distortion-free view enhances your product or message and attracts attention, given the materials gloss finish and brilliance. 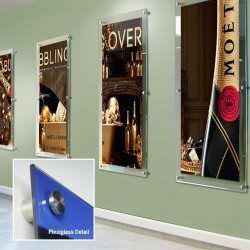 Plexiglass is available in a multitude of colors and thicknesses and can be custom cut to size. When paired with a set of our stylized Sign Standoffs, a simple sign becomes an elegant work of art. Plexiglass can be layered for an opulent presentation. Dibond is comprised of two aluminum panels with a solid polyethylene core that will not warp, corrode or delaminate making it ideal for indoor or outdoor use. Dibond is lightweight, yet is a rigid and durable material. Dibond comes with a smooth factory polyester finish that makes it perfect for high-resolution printing. 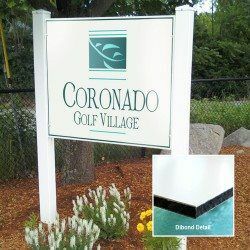 Excellent weather resistance makes Dibond an ideal choice for a wide range of signage and exhibit/display applications. Dibond can be routed or cut to size. Alumalite is comprised of two aluminum panels with a high-density corrugated plastic core that will not swell, corrode, rot or delaminate even under prolonged water exposure. The factory-baked polyester painted aluminum faces add high gloss brilliance and rigidity and will not crack, chip, flake or peel. Strong and lightweight, Alumalite weighs the same as a sheet of .040 aluminum yet is 50 times stronger. 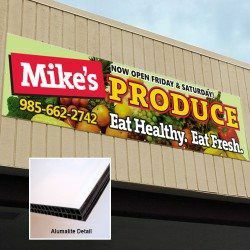 Alumalite is perfect for wall and fence mounted signs, post and panel signs, and billboards. Alumalite can be routed or cut to size. 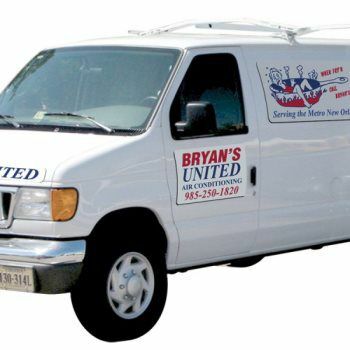 Our quick turnaround and excellent print quality make ordering Decals, Window Graphics, and Magnets a breeze! Permanent, removable, repositionable, clear or white, we have the right material to get the job done. Whether you’re looking for a simple Decal, a Wallscape or to transform an entire walkway into a sea of color and graphics, we got you covered. Ultiflex is the ultimate adhesive! It’s REMOVABLE and REUSABLE! Easy to install, Ultiflex is a cost effective adhesive vinyl that can be used over and over again. Simply place the decal back on the original liner for easy storage and there’s no sticky residue left on the surface. Use Ultiflex for weekly specials, seasonal promotions or directional signage. Ultiflex makes changing graphics simple and saves money because they’re reusable. 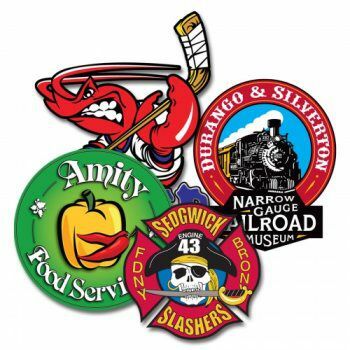 Our Permanent Adhesive full color digital Decals are one of our most popular adhesive products! It offers exceptional print quality and is great for several applications such as: Decals, Wall Graphics, Vehicle Graphics, and much more! Permanent Adhesive can adhere to most smooth surfaces and can be die-cut into almost any shape and size. Our Permanent Adhesive is available in both white and clear. Add a UV Film Laminate for extra protection and longevity! This material is recommended for both indoor and outdoor applications. Smart Clingz with our high-resolution full color digital imprinting is simply amazing! We are one of the exclusive providers of this exciting “clingz anywhere” material. This product allows you to apply your Cling Decal to places never before receptive to Cling such as: drywall, wood, metal, fabric, glass, or brick. This electrically charged film is repositionable and exhibits excellent print reproduction. A recyclable material, we offer it in white or clear. If you are looking for that perfect decal to hang in that unlikely place, Smart Clingz is the answer! This material is recommended for indoor applications. Our Removable Adhesive Vinyl material with a full color digital imprint is similar to our Permanent Adhesive material with one major difference, it’s removable. They both produce exceptional color and print quality and are recommended for indoor or outdoor applications. Removable Adhesive Vinyl material is perfect for short-term use (up to a year) or applications where left over adhesive residue is a concern. Removable Adhesive Vinyl is available in both clear and white and adheres to most smooth surfaces. Like all of our adhesive materials it can be die-cut into almost any shape or size. Contact one of our exceptional staff to assist you in choosing the correct material for your application. Custom Magnets with a full color digital imprint are a great way to get the word out on your business, promotion, product, or event! With our high-resolution vibrant color printing and our vinyl-coated magnet stock, the possibilities are endless. They are great for vehicle graphics, refrigerator graphics, and much more! This material is recommended for both indoor and outdoor applications. 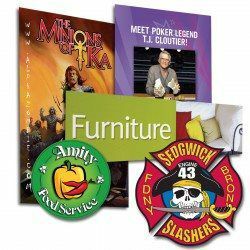 Static Cling with a full color digital imprint installs in seconds but looks great for years! It is easy to clean and is removable and reusable. When removed, Static Cling decals leave no adhesive residue like permanent adhesive can. 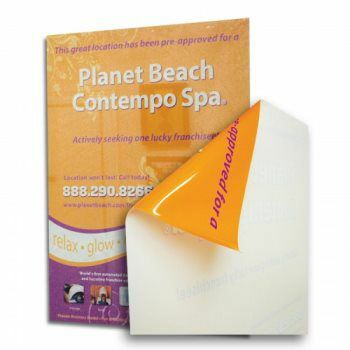 Static Cling material can be die-cut into almost any shape or size and is available in both white and clear. This material is recommended for both indoor and outdoor applications and can be applied to any non-porous smooth surface like glass. 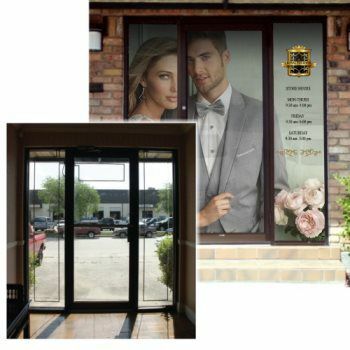 Our Perforated Window Film or Window Perf is perfect for storefront advertising! Fully visible from the outside yet almost invisible on the inside, so there’s no view obstruction. Window Perf is formulated with a removable adhesive that leaves no adhesive residue when removed. Our 70/30 perforation pattern provides more print surface area resulting in superior detail reproduction. Adheres to the outside surface of a window, durable for outdoor conditions and can be top coated with a UV Film Laminate for added protection. We pride ourselves on offering you the highest quality Flags for any occasion, event or everyday use. Using the highest quality materials and state-of-the-art manufacturing, your Flag will be unequaled in appearance and durability. 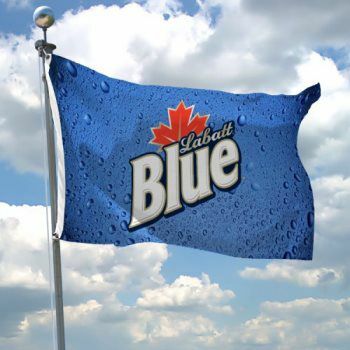 We manufacture our flags using the highest quality UV-resistant polyesters, nylons and ink to create a flag that you’ll be proud to hang anywhere. Let one of our Flag specialists help you determine the right size, material and finishing options for your custom Flag. 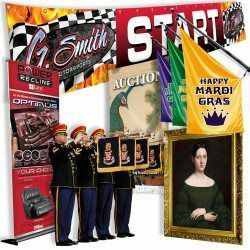 Whether indoor or outdoor, large or small, rectangle or custom shape we are the source for custom Flags. We produce high-resolution custom printed flags with dazzling color. Our process saturates the UV-protected materials with fade-resistant inks, ensuring the longevity and quality of the flag. Custom flags are produced on 200 denier nylon and can be printed with a single/reverse imprint or a true double-sided imprint. Flags can be finished with Canvas Header and Grommets, Pole-sleeves, and/or Fringe, Cord and Tassels. Stock Color Flags are produced on 200 denier nylon and offered in 12 brilliant colors. Choose one of our Stock Color nylon flags and add your custom logo in one or more of the over thirty available logo colors. The graphic imprint is available in 1, 2, 3 or full digital process color. Our Stock Color Flags are available in 36" X 60", 24" X 36", 12” X 18” and 4” X 6”. 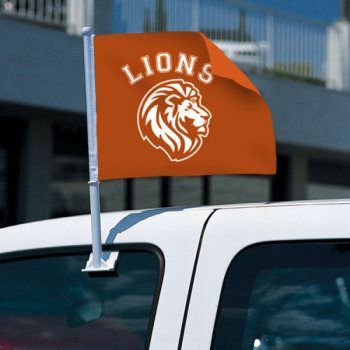 Support your school or organization with our Car Flags. 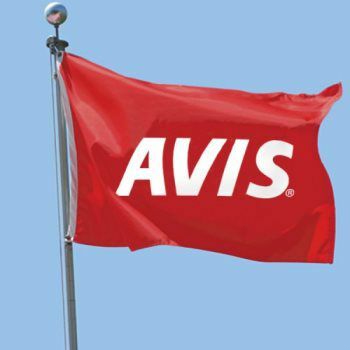 Our Car Flags are produced using a 2-ply 100% polyester fabric and offered in 9 brilliant colors. 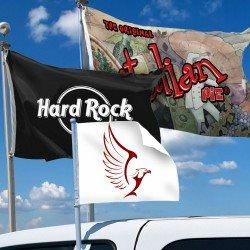 Choose one of our Stock Color Car Flags and add your custom logo in one or more of the over thirty available logo colors. The graphic imprint is available in 1, 2, 3 or full digital process color. Our Car Flags are available in 12” X 18” and come complete with-clip on stand ready to attach to the vehicle. 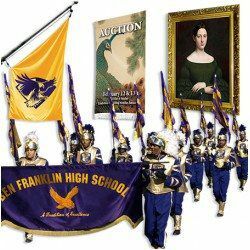 There’s no better way to grab attention than with our top of the line Feather Flags! Our high quality American made Feather Flags are the perfect selling tool. Available with full color digital imprint on one side (with the reverse image viewable on the opposite side) or a true double-sided imprint. 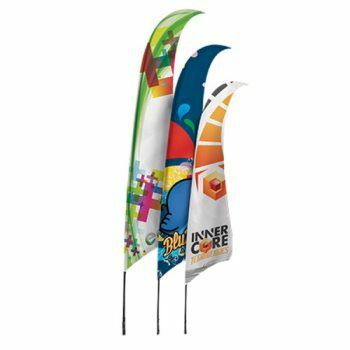 Our premium Feather Flags are available in a wide variety of styles and finishes and are designed to maintain the flag shape, to allow for visibility of your imprint, even in windless conditions. 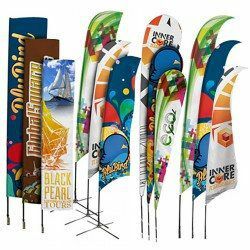 Our rotating ground spikes and wide selection of bases and mounts make these flags a perfect solution for any location. If you are looking for the highest quality Table Cover, then you've come to the right place! We offer everything from one, two, and three spot colors to full color digitally imprinted Table Covers that are available in any custom size and finish to suit your needs! We can even imprint metallic colors! Custom printed Table Runners, Table Skirts, Stretch Spandex Table Covers, Open Back Table Covers, Open Side and Back, Front and Top Only Table Covers, Fitted Table Covers, Convertible 6’ to 8’ Table Covers and more, all available from your Table Cover experts. All Table Covers are Machine Washable and Dryer Safe. Ask us for more details. Project a professional image with a custom logoed Table Cover! 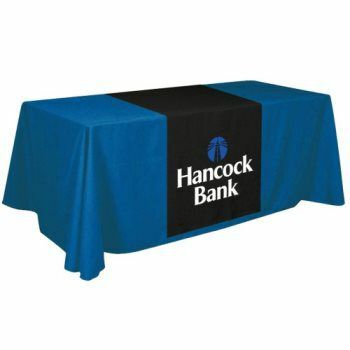 Choose one of our Stock Color polyester Table Covers and add your custom logo in one or more of the over thirty available logo colors. The graphic imprint is available in 1, 2, 3 or full digital process imprint. Our Stock Table Covers are available for 6’ or 8’ standard 30” top tables in either throw or fitted styles. Other sizes and colors available depending on quantity. Speak with one of our Table Cover experts to discuss all the available option. For a distinctive look that’s sure to set you apart and get you noticed, choose one of our Stretch Spandex Table Covers. Sleek and refined in appearance, our Spandex Table Covers conform to the table shape so your logo draws the attention. Simply stretch the Table Cover over the table corners and the bottom of the table legs fit into reinforced pockets for easy set up. No need to worry about wrinkles, and all of our Table Covers are machine washable. Available for square, rectangular or round tables in a variety of sizes. The graphic imprint is available in 1, 2, 3 or full digital process image. Make your event glow by adding our low voltage LED Light Kit under the table to light up your logo. One of our Table Cover experts will be happy to discuss how easy it is to put your name in lights. 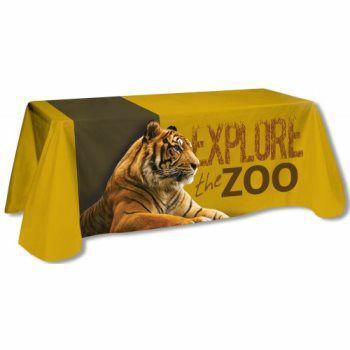 Stand out from the crowd with a digitally imprinted Custom Table Cover with edge-to-edge print. Custom Table Covers are available in almost any size or shape you can imagine. 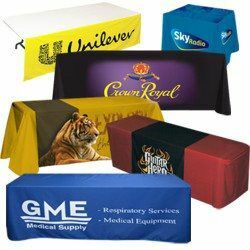 Our premium Custom Table Covers are made from a polyester blend fabric and are machine washable. Choose either fitted or throw style Table Cover, custom printed, cut and sewn to your exact specifications. Perhaps a Convertible Table Cover that adapts to more than one size table is what you’re looking for? Whatever your needs, when it comes to Table Covers, we can do it! 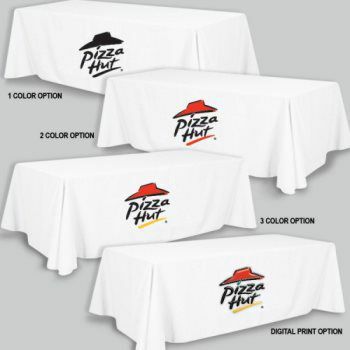 Speak with one of our Table Cover experts to discuss all the available options. 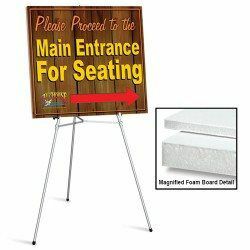 Turn a boring exhibit table into and exciting message board for your company or organization. Our premium quality custom polyester table runners can be designed to fit any size table. Table Runners can run vertically, horizontally or both across the table with your logo or message prominently placed for all to see. Our custom printed Table Runners will attract attention and leave a lasting impression. 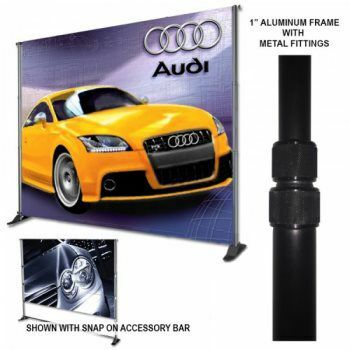 They’re perfect for tradeshows, conventions, school functions and meet and greets. 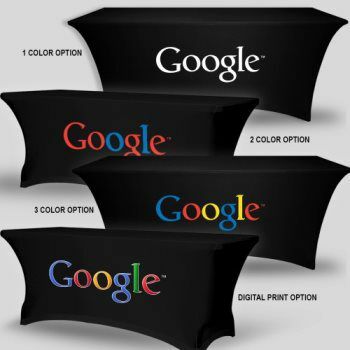 Use it with one of our custom printed Table Covers or by itself. Either way, you’ll stand out from the crowd with a professional image that will be remembered. Looking to make a big splash at your next event? 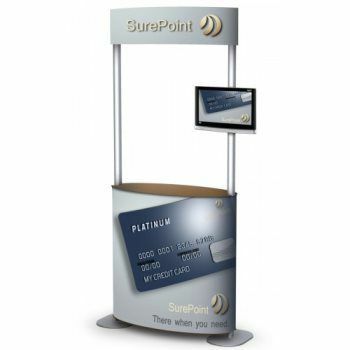 The dynamic and versatile XPRESS Line Pop Up Displays may be exactly what you need! XPRESS Line Pop Up Displays offer tool-free set up in minutes, aluminum frame construction, & velcro perimeter for graphic placement. 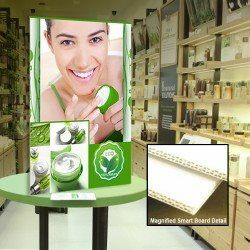 Available in 8’x8’, 8’x10’, & 5’x5’ sizes, each display comes with a full color graphic, that can be configured with or without side panels, & includes a canvas travel bag. Contact a member of our team today, to see which XPRESS Line Pop Up Display works best for your event! 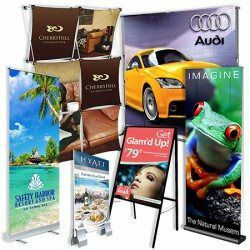 Our Premium Adjustable Banner Stands are the best in the business! 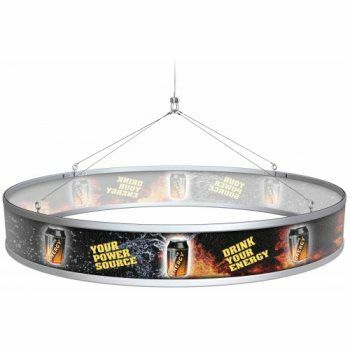 They feature aluminum construction, tool-free assembly, adjustable height, and horizontal poles on top and bottom for easy installation and removal of graphics. They assemble in just 5 minutes and are made in the USA. Standard models adjust in height from 36” to a maximum height of 96” and are available in two adjustable width sizes: 30” to 48” wide or 52” to 96” wide. Both sizes are available in black or silver. Our Premium Retractable Stands are the finest available and are made in the USA! 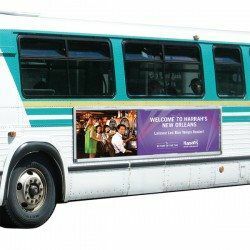 They feature aluminum construction, tool-free assembly, height adjustment from 36” to 96” and our very own “Easy Graphic” Velcro system that makes changing the graphics a snap! These stands are available in widths of 24”, 36”, 48” and 60”. Single and double-sided versions are available in black or silver and a custom nylon carrying case is included. 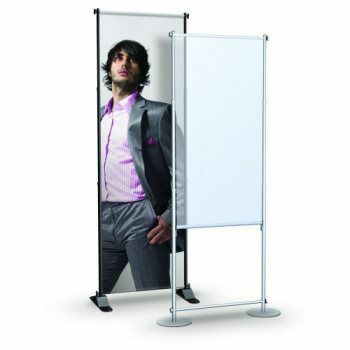 Looking for a simple & cost effective display solution for a backdrop? Our Economy Adjustable Stands are a perfect fit! Constructed out of lightweight aluminum, high-impact PVC fittings, & steel feet, Economy Adjustable Stands are lightweight yet stable. 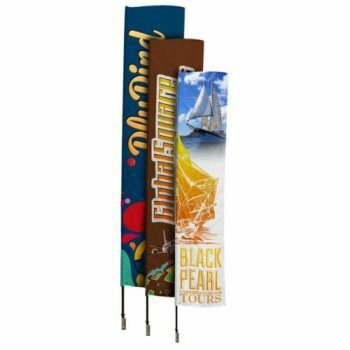 Fully adjustable telescoping poles, allow these stands to accommodate banners ranging 4’ wide x 3’ tall, up to 10’ wide x 8’ tall, & all units come with a deluxe padded canvas carrying case. 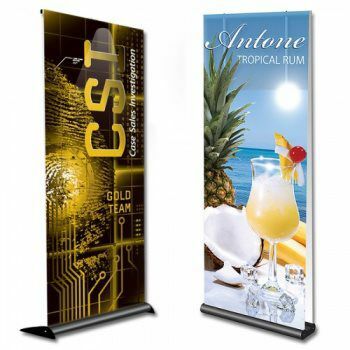 Our Economy Retractable Stands are one of our most popular items for promotional use. The all aluminum stand has a set size of 24", 33", 39" or 47" wide by 80” high. The stand is accompanied with a 13 oz Vinyl Banner printed in brilliant digital color. Our Economy Retractable Stands include a fitted nylon carrying case. We also offer a 13 oz curl-free Printer’s Choice Vinyl material upgrade at an additional charge. If the strength and durability of our Premium Retractable Stand is overkill for your situateion, our Economy Retractable Stands are the way to go! 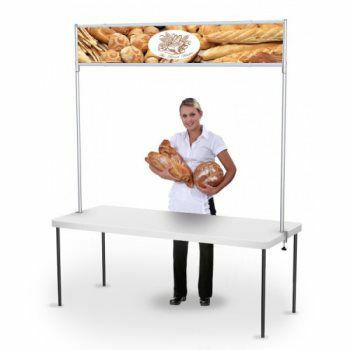 Available in 24”, 30”, 36” and 48" widths, this versatile and lightweight Display Stand has an easy tool-free assembly for quick assembly and take down. Each Stand accommodates graphics from 3’ to 8’ in height, making this aluminum alloy Display Stand a dynamic and versatile advertising tool. 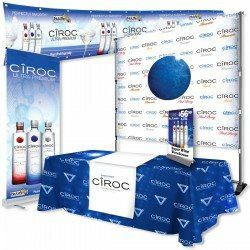 Graphics affix to the Display Stand through pole pocket mounting; both vinyl and fabric material options are available for this stand. The name says it all! This stand is so easy to set up, it’s a snap! We created our Rapid Stands with the idea of creating the easiest stand in the world to assemble with the quickest graphic change ever. Available in silver or black, this sleek design features 1” diameter anodized aluminum uprights with swage and spring button construction. Modular sections can be added or subtracted to change the height. Full width steel base offers substantial support. Available in widths of 24” and 36” with heights up to 84” tall. LED Cascade Light available. You can hang them from a ceiling, snap them on a pole, hang them on slat wall, clamp them to a tabletop or mount them on a wall. Wherever you put them you are sure to draw attention. Constructed out of solid aluminum alloy with an anodized satin finish these 2”x 3” Clips feature rubber grips to hold your graphic tight. Grip range up to ½” thick material. Whether you hang them or use them on a countertop, these handy Snap-On Clips turn a simple card into a complete display unit. 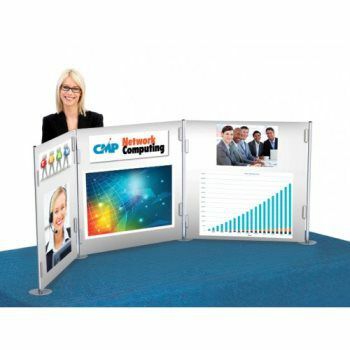 This unique Telescopic Table Header Display clips directly onto a 6’ or 8’ display table and will garner lots of attention. Two crossbars telescope from 70” to 96” with the bottom crossbar snapping anywhere along the upright, so the banner height is fully adjustable. The Display attaches to your existing table via two heavy-duty 2.5” adjustable clamps. 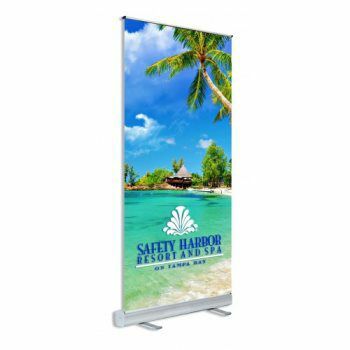 Two telescopic anodized aluminum uprights provide a professional look for your banner, printed in high-resolution full digital color. Simple, portable, and economical perfectly describe our highly popular Table Top Styrene Displays. 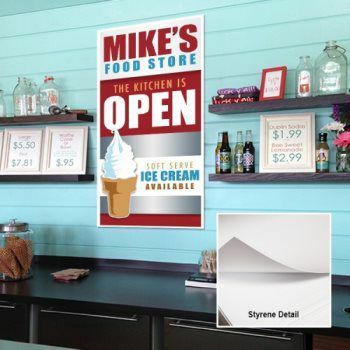 Our styrene signboard with vivid full color digital imprint loads easily via a clamp system. This Table Top Display is available in three or four panels wide and at 24” or 36” tall – but the width of each sign is completely up to you! A professional matte silver finish and sturdy base make this tabletop display a true winner. Our VUE Display system is an innovative visual merchandising exhibit system featuring tool-free assembly. VUE’s clean design, easy graphics integration and modular construction can be assembled in an infinite number of ways. With our custom VUE Display Systems you can design a system tailored to your exact needs. VUE Podium Kit Features furniture quality podium with tool-free assembly and a heavy-duty elliptical shaped top and bottom in either clear Acrylic or Birch. It also features contemporary oval bases, substantial crossbars and designed for graphics to wrap completely around podium. There are numerous accessories including shelves, overhead signage and ipad holders are available to tailor your Vue System to your exact needs. Infinite configurations available! Dimensions: 43-1/2” w X 43-1/2” h X 15-3/4” d.
This all-metal construction frame is made of anodized aluminum with gentle radius corners. It is perfectly suited for a pillowcase graphic to vibrantly display your message. With a quick easy assembly, this strong yet lightweight frame features a tool-free assembly and heavy 12lb steel base for remarkable stability. Starting at 8’ high and 8’ wide, the Display Wall is available in widths up to 20’ wide, ensuring that no one will pass you by. 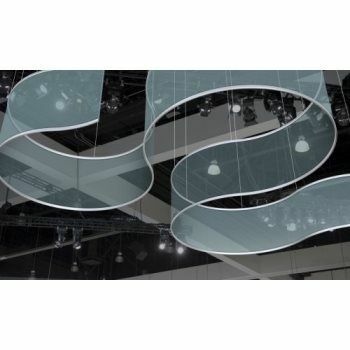 Our Free Form Hanging Rails are an innovative and aesthetically beautiful solution for hanging curved graphics. The best thing about our Free Form Rail system is the ability to incorporate lower cost graphic media in an overhead display. The satin finished aluminum profiles make forming simple curves or elaborate free-form shapes possible. Perfect for use with styrene or fabric graphics. Your message comes alive when we integrate your custom Graphics with our Sky-Rail System to create a modern combination of form and function. Constructed of lightweight aluminum, our Sky-Rail System is handsome, yet an economical solution for hanging curved graphics. The Sky-Rail System is comprised of curved satin finished aluminum profiles that house the graphic top and bottom. Like the Free Form Sky-Rail System, we’ve created an overhead display hanging system that beautifully displays lower cost graphic media. Square and triangle shapes also available. Designed to grab attention and impress, our G-Line Frame System lets you stand out from the crowd. Built from lightweight aluminum, it’s completely customizable to your exact needs and specifications. 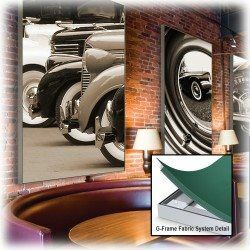 Totally versatile, our G-Line Frame System houses a high-resolution fabric graphic that easily attaches to the frame. Graphic changes are quick and easy with our system. We designed our system to fit your needs whether you’re looking for a free-standing display, a wall-mount display or even a backlit display, the G-Line Frame System provides a luxurious appearance at an affordable price! Available for both single and double sided graphics. 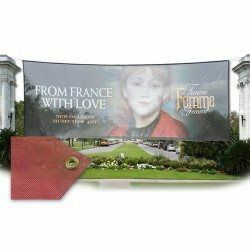 Hang your Avenue Banners with confidence with our quality Avenue Banner Bracket Kits. 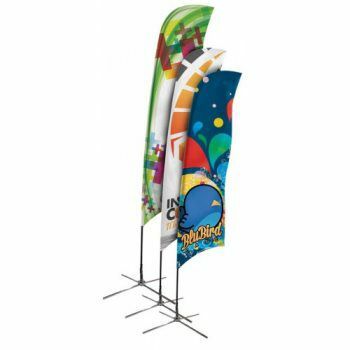 Each kit contains everything you need to attach your banner to a pole. Single Banner Kit includes: 2 Aluminum Brackets (Upper and Lower) 2 Banner Rods (please specify size) 4 Stainless Steel attachment bands 2 Pins with rings 2 Securing straps Choice of Aluminum or Fiberglass Rods Available in single and side by side configurations in 18”, 24”, 30” and 36” widths. Brackets are canted at a 1-degree angle to provide tension to hold banner taut. 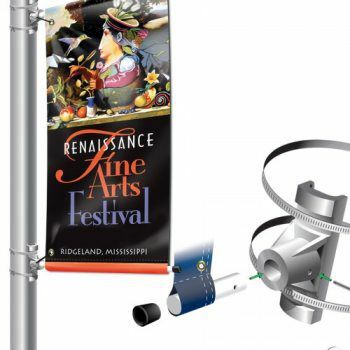 Our Flat Mount Building Banner Bracket Kits are the perfect solution for installing your banner on flat surfaces, such as square poles, walls, square column faces and more. 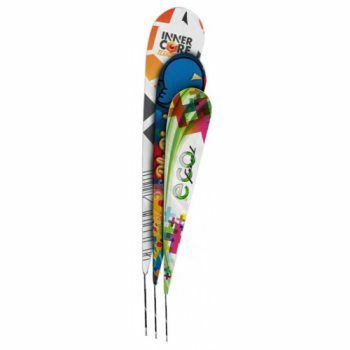 They are cast aluminum alloy and feature your choice of either fiberglass or aluminum rods to suspend your banner. 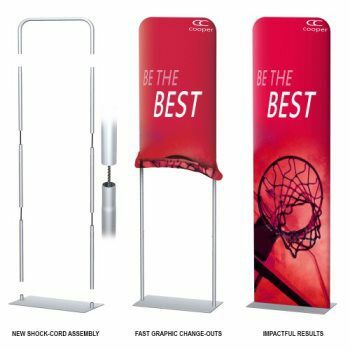 Available in 2 versions, one that holds your banner flat against the mounting surface and one that holds your banner perpendicular to the surface. 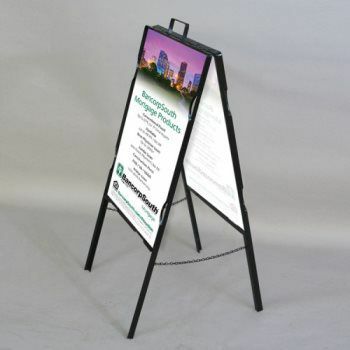 Our A-Frame sign holders are perfect for prominently displaying your signage on roadsides and sidewalks. 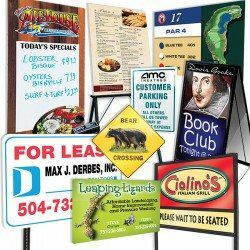 They are ideal for use as menu boards and displaying daily specials. Great for displaying services such as valet parking, temporary event directions and conference directories. Constructed from 3/4” x 3/4 ” steel angle, they feature our Slide-In no hardware sign attachment system that holds your sign firmly in place. Convenient carry handle located on the top for easy portability. Available in many sizes. Our versatile H-Frames are perfect for advertising real estate properties, job sites, event signage and announcements. Their slim design lets your sign do the talking. Constructed from 3/4" x 3/4" angle-iron steel, these strong and durable frames will hold up to the toughest outdoor elements. Available in many sizes. Standoffs are the perfect way to mount your sign while giving it a high end and unique three dimensional appearance. Standoffs are used in office buildings, retail stores, museums, schools, and more! They are available in many different colors, finishes, styles, and materials. The options are nearly endless! 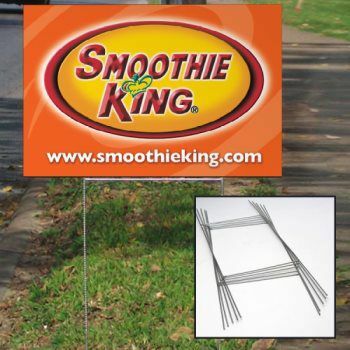 Step Stakes are the industry standard stake for use with temporary or short term corrugated plastic yard signs. Our steel wire Step Stakes are cost effective and easy to install and remove. They are available in a light duty, as well as a heavy duty version.